Researchers in Southampton are leading a groundbreaking study into whether or not a drug used to treat heart failure could save the sight of patients with a currently untreatable eye condition. 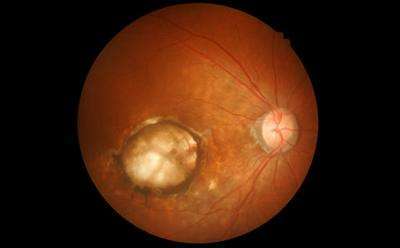 Central serous chorio-retinopathy (CSCR), which is a type of macular degeneration, affects mainly people in their thirties and forties and occurs when fluid gathers under the retina and damages the tissue. There are 10 new cases diagnosed per 100,000 men and two per 100,000 women in the UK every year and, although some cases spontaneously resolve, some persist for years, recur or affect the second eye and around a third of patients suffer permanent vision loss. Now, Andrew Lotery, Professor of ophthalmology at the University of Southampton, is leading the first study into the long-term benefit and safety of the drug eplerenone for the disease. The £1 million project will involve 104 patients across 20 sites in the UK and participants will receive either the medication or an identical placebo tablet for up to 12 months. "This is a really important study because a number of patients suffer permanent vision loss as a result of this condition, the cause of it is unknown and there are currently no proven treatments for it," explained Professor Lotery, who is also a consultant ophthalmologist at University Hospital Southampton NHS Foundation Trust and research director for his team's charity the Gift of Sight Appeal. "Recently a small number of patients have responded to treatment with eplerenone and that is exciting but information on the long-term benefit and safety is lacking, so we hope this landmark trial will establish the first scientifically proven therapy for CSCR." Professor Lotery said although the cause of the condition is unknown, it can occur in families and some genetic changes have been found, so another area of focus for the project will be to prepare for future studies covering this area. "As part of our research we will also collect blood samples for use at a later date to allow us to study proteins and chemicals in the blood stream and patients' DNA," he explained. "Once this first stage of testing the effectiveness and safety of the drug is complete, we will seek to determine what genetic variations are more common in CSCR patients and which proteins or genetic variations help predict who best responds to treatment with eplerenone." Early-stage research into CSCR was funded and supported by the Gift of Sight Appeal (www.giftofsight.org.uk). Professor Lotery added: "The success in securing support for this major CSCR project indicates the value of the Gift of Sight Appeal as the initial funding it provided has enabled us to demonstrate the potential value of larger studies, helping us to obtain considerable financial support."